Have you ever daydreamed of turning back the clock to a more youthful, more energetic, more carefree time in life? Or perhaps having at your disposal a magical cosmic Undo button that could erase certain effects that have accumulated over the course of time—from stress, abuse, or other erosive habits that have left you with less than perfect health or a waning enthusiasm for life. I experienced the need for a second chance at a clean slate earlier in life than most. I was only 25 when I received a diagnosis of cancer. That cancer was just the last in a whole host of serious problems I’d had. Those of you who are familiar with my story know that I had a horrendous childhood filled with sexual and emotional abuse. I’m certain I had post-traumatic stress disorder by the time I was four. By my teenage years, I was a complete wreck. At that point, I began doing everything possible to numb my feelings and run from them—I smoked, drank, took drugs, and acted out promiscuously. I was anxious. I was depressed. When my cancer announcement came, it was really time for a change. By then, I needed some truly powerful help to undo all that I had been through so that I could continue to live. Amazingly, I found it—the way to turn back time and release the many effects of all of the stress that my mind and body had endured. That way was meditation. A daily practice of 20 minutes, twice a day, gave me much more clarity to address my disease and ultimately helped me to heal my cancer, release my addictions, and end my destructive streak and get on my true life path. I can honestly say that meditation is the best thing I have ever done for myself. So much so, that I haven’t missed a single day of it in 30 years. I am not alone in this discovery. 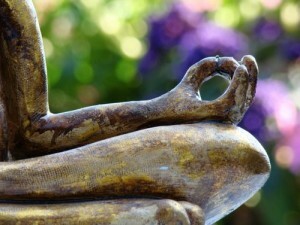 Science and religion alike have studied and documented the vast numbers of benefits of meditation, revealing that meditation has a positive effect on people suffering from or at risk for many physical and mental health conditions, including high blood pressure, atherosclerosis, congestive heart failure, stroke, diabetes, menopause, ADHD, memory loss, anxiety, obesity, and much more. It was even found to be twice as effective in helping people to quit smoking than the other popular remedies. Given that smoking is the number one cause of preventive death in the U.S., this is no small benefit! The studies also show advantages in other areas of our lives, such as making us more effective on the job and in school. So what is meditation and how does it create so much good for our bodies and minds? A big part of meditation’s success on improving conditions like those listed above is its powerful ability to reduce and release stress, as stress is often a precursor to so many of our physical and emotional problems. But the manner in which it does this happens at a lot deeper level than many people might think. Meditation works at the level of our consciousness. There are four states of consciousness: waking, sleeping, dreaming, and meditating. So, meditation is actually a different state of consciousness from our waking life. It is a far more expanded state. Many people think that the purpose of meditation is to tune out, to get away from it all. While that’s partially true, the real purpose of meditation is actually to tune in—to take the journey into expanded consciousness that meditation provides. Once you get into that gap, you’ll find that, through this all-pervasive web of energy, everyone and everything is connected to everything else. You also discover that this universal field of energy is unlimited; it’s pure potential, and anything can be accomplished when you’re connected to it. When we connect to the Unified Field through meditation, our bodies and psyches are cleared, leaving us refreshed, restored, and balanced. Just 20 minutes of meditation offers as much rest as 1-2 hours of sleep! The effect is truly a turning back of the clock, where we look and feel healthier and younger. We can experience other profound changes by tapping into the Unified Field through meditation. To heal ourselves and fix our lives, we need information. We need to root out the true cause of what is ailing us, and find the most expeditious and effective route to a cure. I certainly learned this with my experience of cancer. When you tap into the Unified Field, you are accessing life’s great encyclopedia—where every fact of the universe, past, present and future, exists and is accessible. You are also connecting to your own highest wisdom., and the insights that come from meditation help us to heal every area of our lives. In this way, meditation paves the way for emotional healing. On an energetic level, it helps to remove any blockages that come from holding on to anger and resentment. Meditation thereby ushers in what is perhaps the most crucial part of the healing process, forgiveness. It opens us up to our connection to other people, and to All That Is. In this way, meditation also paves the way for global peace and well-being. That brings me to the most important reason I can think of to meditate. Even after all of the benefits I’ve touched upon here—the better health, becoming wiser, doing better at school or work, experiencing forgiveness, and having less anxiety, more creativity, greater joy, looking and feeling younger—I still haven’t told you the real purpose of meditation. The most important outcome of your meditating every day is that by expanding your awareness, by bringing yourself into balance and experiencing greater peace, by raising your consciousness—you are actually assisting every other person and creature on the planet to do the same. Remember, we’re all connected by one vast field of energy. The ripple of energy you send out into the world is a reflection of your inner state of being. Your ripple touches and affects others. If you’re uplifted, you uplift them too. If we’re all in a higher state, we just might feel more inclined to help one another and come up with some harmonious and creative solutions to our global problems. What a different world that would be! I can’t recommend enough that you learn to meditate—for your own well-being, for those you love, and for making a positive difference on the planet and fulfilling your life’s potential. If you’d like to learn to meditate come learn with me via on-demand video. For more information on learning to meditate, please click here.